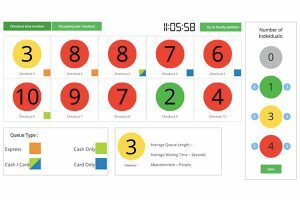 People counting devices help businesses estimate the number of customers that visit their physical stores or offices every day. Heatmap technology shows them how visitors move about in the space; the sections people visit the most, the products they interact with, and the average number of minutes spent in each section. Queue management devices, on the other hand, show them how long every customer spends at the checkout counter. These devices provide raw data but without proper interpretation, the data is basically useless. The Business Intelligence Platform interprets the data collected and presents it in the form of easily-understandable reports. This makes it possible for managers to come up with data-backed business and marketing strategies that optimize their service delivery, improve visitor-to-customer conversion, and increase sales. How many customers come into your store but leave without making a purchase? What is the prevalent reason for customers abandoning their carts? What measures can you put in place to avoid such an occurrence in the future? The answer to these questions can help businesses reduce lost sales opportunities and improve their conversion rates. With data from people counting devices in the store, the Business Intelligence Platform can analyze customer traffic vs sales completed. This tells the manager how many sales opportunities were lost per hour (or per shift). If, for example, data from the queue management devices show that there were long wait lines during this period, it becomes apparent that customers abandoned their carts because the checkout queue was too long. The data illustrates that the store was ill-prepared for, and as a result, overwhelmed by heavy visitor traffic. Steps may then be taken to prevent a reoccurrence, e.g., opening new checkout lines and diverting some staff from less busy sectors to checkout duty. Business locations that provide certain services such as banks, telecom service centers, car showrooms, restaurant & bars, etc., need to have a good staff-to-visitor ratio to ensure optimal service delivery. Consider this: if there are 10 customers in a restaurant and only 2 attendants are available, there is little to no possibility of all the customers receiving a satisfactory service. If the number of attendants is increased to 6, the quality of service increases considerably. The Business Intelligence Platform uses historical data from heatmap and people counting devices to provide managers with staff-to-visitor ratio per hour (or per shift). This shows them their day-to-day staffing status. Also, via computer automated tips, the platform provides managers with information on how many staff/attendants need to be deployed at any particular time to ensure peak performance. As a result, managers can give their staff time away during slow periods and during peak hours, have all hands on deck. Imagine creating a new advert and being able to measure how many new customers visited your stores because of it. Or launching a new marketing initiative and being able to determine the impact that it had on sales and customer conversion. 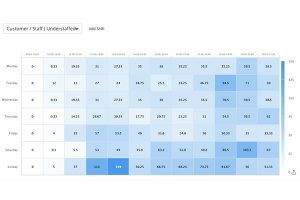 The Marketing Campaign Analyzer provides businesses with a comparison of customer activity in their stores before and after unveiling a new marketing effort. People counting devices provide the numbers on how many more customers are visiting the store, heatmap data shows how many people are checking out that new product and the Business Intelligence Platform interprets this data and provides an estimate of how much more traffic was gained/how many more sales were made because of the new initiative. Changes in other performance indicators like sales conversion, footfall activity, dwell time, etc. before and after the campaign may also be measured. This makes it possible for businesses to measure the impact made per $ spent on marketing, and ineffective campaigns may be scrapped. The information may also be used to fine tune strategies that work, making them even more effective. Long queues at the checkout counter are the number one reason for cart abandonment in retail. To make matters worse, once a store gains the reputation of always having long wait lines, customers avoid the store and seek out more efficient options. The Business Intelligence Platform provides managers with information on how many customers are in a checkout queue at a particular time and how many of them abandoned their carts during that period. This helps the manager implement practices that will reduce the average waiting period and make the store more efficient. The manager also gets notified in real-time when a queue is getting too long, giving them enough time to set up emergency checkout stalls before customers start getting impatient. The shorter the checkout lines and the more efficient the store is, the lower the cart abandonment rate and the higher the sales conversion rates. V-Count is the foremost provider of visitor analytics in the world. Via our Business Intelligence Platform, we provide customers with a cloud-based storage infrastructure that analyzes collected data using artificial intelligence and machine learning tools. As a result, we are able to provide clients with information on how well their store (or office location) is performing. Additionally, we offer reports and features that help improve operations and optimize new business initiatives. We offer products and services to clients in over 100 countries worldwide. Please visit v-count.com for more information or call +1 866 549 9360 to begin your free trial.